Blueprint Gaming releases explosive Viking battle extravaganza with stunning visuals and a thunderous soundtrack that will shake the gods – find out more about Vikings Unleashed MegaWays. 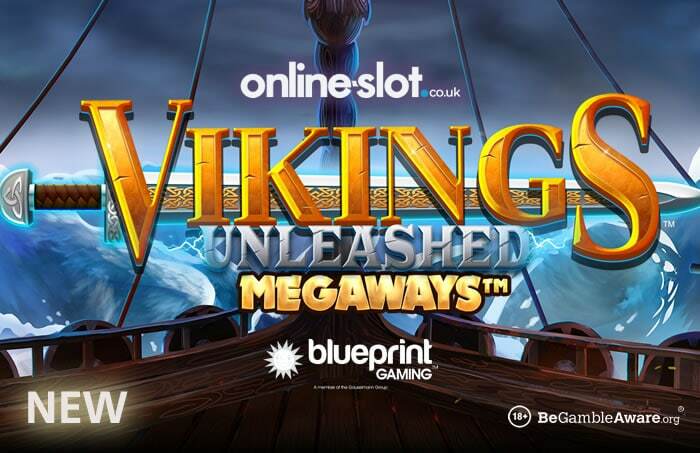 Vikings Unleashed MegaWays is the latest MegaWays title to be released by Blueprint Gaming following on from Primal MegaWays recently. With 6 reels and up to 117,649 ways to win, take to a Viking longship from as little as 20p a spin on desktop, mobile and tablet devices. With sorcerers, female vikings, Berzerkers and male vikings on the reels, each spin sees a different number of ways to win – up to 117,649. Look out for Thor’s hammer as this is the mystery symbol and transforms in a randomly selected symbol to give you enhanced winning potential. The main attraction is the Battle of the Seas Free Spins feature where you try and gamble for a higher number of free spins or an increased multiplier before the free spins begin. If successful, you could begin with 27 free spins or a 10x multiplier. If you lose though, you return to the base game! Once in, each win increases the multiplier by 1 with the winning symbols being replaced by new ones – there’s no limit to how high the multiplier can increase too. You can also win an infinite amount of additional free spins! You can play Vikings Unleashed MegaWays at various online casinos – I recommend LeoVegas Casino though. Sign up now to get 20 no deposit free spins on Play ‘N Go’s Book of Dead for starters. Then there’s up to £400 in bonuses and 80 more Book of Dead bonus spins – you will get a 100% match bonus up to £100 plus 20 Book of Dead bonus spins on your first 4 deposits!